Feeding bees in winter is different than feeding them in summer or autumn. Knowing the difference can mean life or death for your colony. If you could have the choice of drizzling golden honey over your food or white sugar, what would you choose? If you were a honeybee, you’d choose the honey of course! It’s made from everything that bees need to last them through lean times including energy, vitamins, minerals, and other micro-nutrients. Sometimes they run out of their own supplies before spring fully kicks in. It’s then that a beekeeper needs to come to the rescue and feed their honeybees. Feeding or not feeding bees in winter can mean life or death for the colony. It’s now early April and just warm enough (10ºC/50ºF) to open my colonies to have a look inside. The video above is of my first inspection of the year so do have a watch. 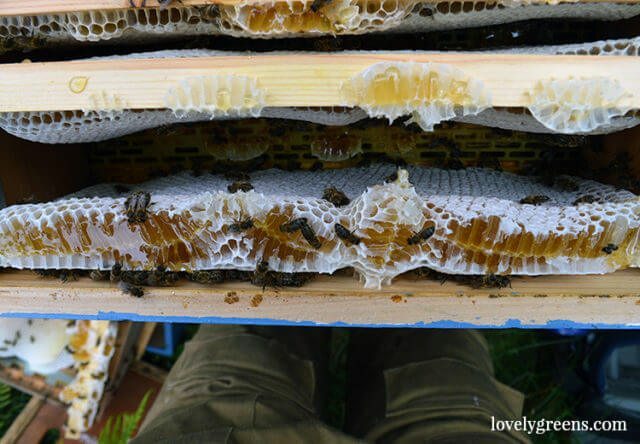 In this first look I’m looking for signs of eggs being laid, sealed Brood (baby bees) in the comb, dampness in the hive, disease, and most importantly, honey stores. Fortunately, my honeybees had plenty of honey this year so I won’t have to give them emergency rations. I’ve had to feed them in years previous so it’s important to look inside the hives and see if they need food as early as possible. I begin peeking on fine days in January by taking off the roof and sliding the crown board over a few inches. If the frames I look at have honey then I’ll slide it close and leave them for a couple of weeks. If they’re critically low on honey, I’ll feed them. 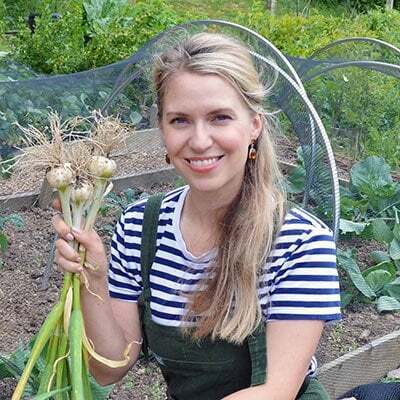 Supposing that I didn’t look in on them early enough to spot their shortage, they could starve before spring. Honey is the best food for bees! This is of a comb that my bees built without a frame. The earliest part of spring can be the most dangerous time for honeybees. They’ve been eating away at their honey stores all winter and are now starting to rebuild their numbers. That means that the Queen is laying eggs and the colony begins foraging for whatever nectar and pollen they can find. Honeybees need energy for these foraging missions and if their honey supplies are depleted, they’re in big trouble. Honey is the best food for bees so the first thing a beekeeper should do is to ensure that their bees have enough winter stores to begin with. One of the best times to take a honey harvest off is at the end of summer. If you take honey off then, the bees will still have time to replenish their supplies in time for winter. They need at least their Brood box and one Super filled with supplies to last the winter. What I always do is leave them a full Super full of their own honey, because I believe that its quality is far superior to that of honey made from sugar syrup. Some beekeepers take off as much as they can which is not in their bees’ best interests. These beekeepers have to feed their bees with sugar syrup that the bees quickly convert into a weak honey. If it’s been a bad summer, then I’ll feed my bees homemade sugar syrup too — as a last resort. It’s a mixture of 2 parts white sugar (in weight) to one part water (in weight) that is simmered together into a simple syrup. You feed it to the bees through a rapid feeder and they use what’s left of the warmth of the summer to evaporate the water out and convert it into honey. 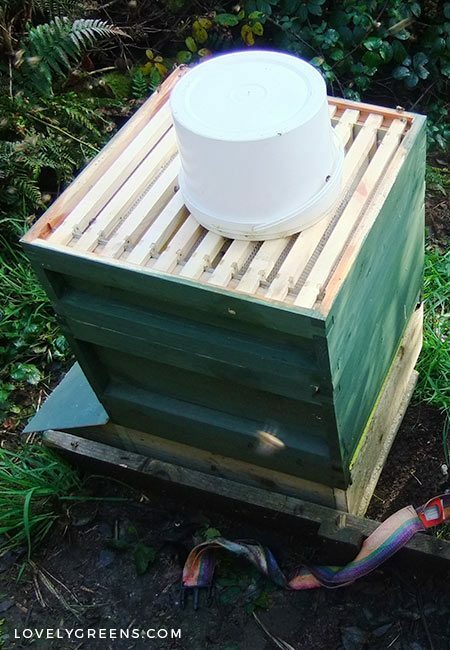 This works when it’s warm and the colony is active, you would not feed your bees like this in winter though. 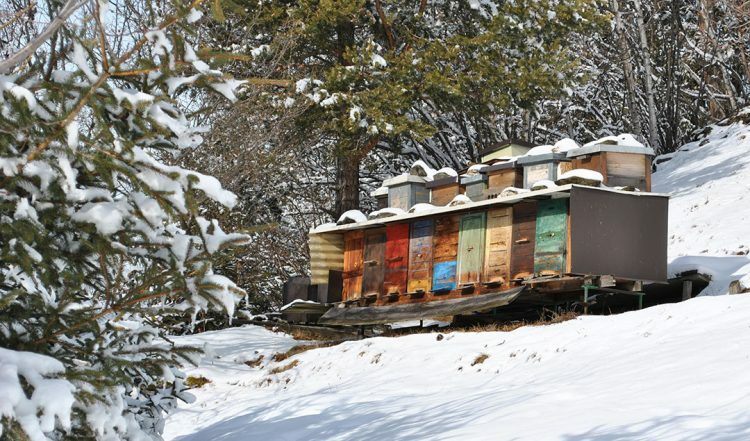 The biggest challenges to bees in the winter is cold and damp. Bees keep at least parts of their hive a warm 33ºC/92ºF throughout the year, including the winter months. In the summer it can be roasting inside which is why ventilation is very important. In winter, the warmest part of the hive is the center of their cluster. Putting a bucket of syrup in the hive means the bees have to work even harder to keep the hive warm. Wet sugar syrup can make the hive damp too and this can also kill the bees both directly and indirectly. Instead of wet food, you feed bees fondant in winter. Fondant is a sugar paste that you’ll see used to decorate cakes and other sweets and it usually comes in thick white bricks. Fondant is made using 4 parts sugar (by weight) to one part water (by weight) with a tiny splash of vinegar. Most beekeepers just buy it though, usually from a bakery or a beekeeping supplies company. You can even get fondant that’s been mixed with bee pollen. 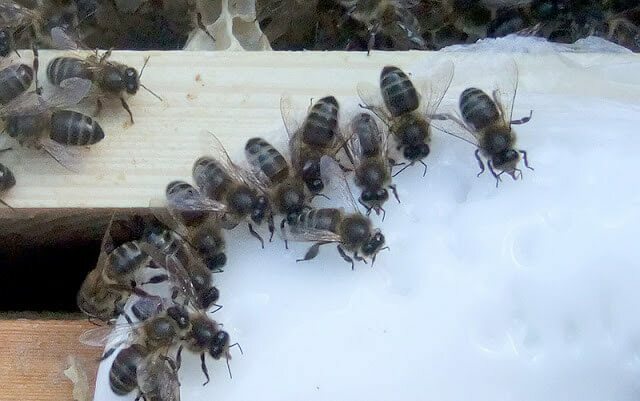 Placing fondant in a hive needs to be done in a particular way, otherwise it can end up killing bees. In the hive, fondant will melt a little and become soft and sticky. If bees can climb on top of it then there’s a chance that they’ll get stuck in the stickiness like a desert wanderer in quicksand. 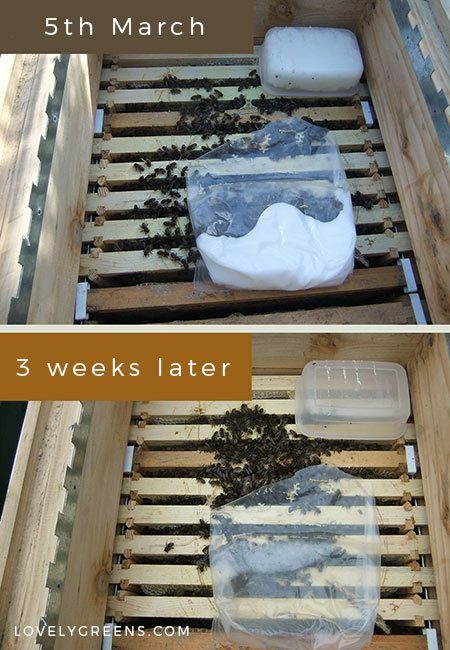 There are usually a few causalities when you feed bees fondant but there are ways to minimize the issue. I’ve found that the best way to give bees fondant is either from the plastic bag the fondant arrives in or in an upside down bowl. With the bag method, I cut the plastic off one short edge of the bag. Then I just place it in the hive as-is. The bees come in at it from the side and eat away at the paste from there. They climb on the frames below without having to stand on the fondant. If you’re making fondant yourself, pour it into small plastic tupperware or take-away containers. 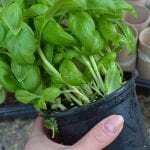 Place these in the hive upside down and the bees have to come at it from below. Again this helps prevent them from walking on it. 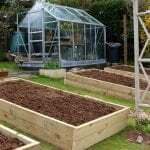 With this method you can put the containers directly on the frames or on top of the crown board and over one of the openings. 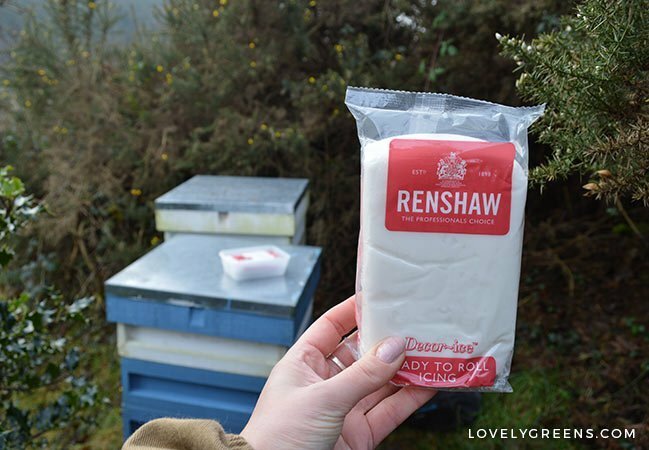 The amount of fondant you feed to your bees is dependent on how low their stores are. It’s also dependent on what time of the winter it is, how cold it is, and when you can next have a look inside the hive. My climate is mild so I can generally peek in throughout January to March on a calm day. That means I’ll pop a couple of pounds of fondant in at a time and look again after two weeks. If you’re in the middle of a blizzard or are expecting one, then the hive should not be opened. If it’s colder than 10ºC/50ºF but a fine sunny day then you can take the roof off the colony but I personally wouldn’t take the crown board off. Work quickly and place the fondant over the crown board openings, or even better, make a full Candy Board and place it on top. You may need to place an empty super box on top before replacing the roof. This in very good side. I live in Finland, south fi. I want know lite more than lovely bees…in the word.